- Good morning, Irina Grigorievna, what news? For not much less than forty years my working days started with this greeting by telephone. For a long time Bruno Maximovich pronounced my name with an English accent until he noticed that "Irina" is much easier pronounced in Russian. And then he jokingly showed indignation: "Once again you haven't corrected me! How many years I've been breaking my tongue, when it is so simple to say it! You must know that you are to blame for my speaking bad Russian: you have learned to understand me and never correct me". We look at Bruno Maximovich's notebook and correct his day schedule. I know that if his plans change, he will be sure to find me and tell me. He is very punctual in his relations with people and highly values another's time. The little pocket notebook, presented to Bruno Maximovich by someone, was to last for 2 years and for this peculiarity, permitting to compare entries, was dear to its owner. He always had it with him and made regular beadlike entries in Italian in the column under the appropriate date about current affairs, events, impressions. It was something like a diary. When notebooks happened to disappear in Moscow, they were brought from Leningrad, and as time passed we started to make them ourselves. 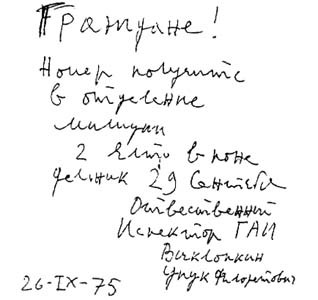 Bruno Maximovich practically made these entries till his last days. Soon after the telephone call, Bruno Maximovich himself shows up in the laboratory - always elegant, with a friendly smile in his gentle Italian eyes. Bruno Maximovich told us how, as a child, he overheard his parents discussing the virtues of their children: the most limited; has kind eyes, but not intelligent. Bruno Maximovich is again upset: "Today I shouted again", - he says. I already know. I had a telephone call from the Administration, where he went on the way to the Laboratory, and I was told that Bruno Maximovich was angry, and that they could not understand what he wanted. Usually, he wanted a letter he was expecting to be handed to him immediately, not after two days. Bruno Maximovich was intolerant of technical personnel demonstrating negligence, tactlessness and irresponsibility in their work. He could flare up and even start shouting. Always for good reason. And he was always upset afterwards and regretted he hadn't been able to hold in his feelings. But there were certainly plenty of occasions not to do so. I have kept in my card index a card on which I once drew, and then crossed out, a yelling face and wrote: "I do not shout"!. Bruno Maximovich added: "Never in my life! ", and put down his initials. Here it is. When in my presence the atmosphere started to become tense, I used to take out this card and wave it. Bruno Maximovich started to smile. With the years he became more and more tolerant and was angry much less often, but only upset. - When you have some time to spare - says Bruno Maximovich, - we shall write a short letter. Just like that: when I have time to spare. It was the same with Vladimir Iosifovich Veksler. I happened to work with him several times in the absence of his stenographer. He used to ring me up from his Laboratory and "adapt" to my free time, before coming over to work with me. A special breed of human beings. All these years people ask me one and the same question: "Tell us how you write scientific articles with Bruno Maximovich. You are not a physicist, and he is not fluent in the Russian language... Does it work!?" - And they look at me piercingly. That I am not a physicist is quite true. And what a non-physicist. In childhood I planned to become an actress, and I not only didn't understand physics, but once I quite openly told my teacher that I was not even going to study it, since it would never be of any use to me. "Who knows", he then said. It was as if he was capable of reading the future. I have been living and working among physicists for forty years, and I don't regret it a bit. How do we work? It's very simple. We sit with Bruno Maximovich opposite to each other at my office desk in the Laboratory reception room, familiar to all of us. There are two telephones in between us, two "bull-terriers" of different colours on leashes. There are three doors in the room. The telephones are always ringing, the doors are continuously being slammed: ring-slam, ring-slam... Ordinary working conditions. Nothing disturbs us. Every minute someone enters the room, and we instantly, without any difficulty, switch over to his or her problems. We are interested and benevolent. We are sure to involve the people present in discussing precisely which word it would be more correct to use in the actual context. If nobody comes up with a suitable expression, we choose a "victim" and ring him or her up by telephone. We write phrase by phrase, we polish each phrase till it is final, and only then do we pass to the next one. This process is longer, but more interesting. It practically permits not going back to something already written. We adopted this approach to our work as the best one, when preparing the works of Enrico Fermi for publication in the 70-ties. That was a great work. It took several years. So, Bruno Maximovich pronounces the first phrase. Naturally, I understand no - thing. He knows this quite well and patiently, in detail and in words comprehensible to me, explains the essence. He says: "If you don't understand, that means I don't speak clearly. Any problem, however difficult, can be explained in easily understood language." I sit there and listen. Sometimes I ask questions. Often we start talking of totally irrelevant things... How I love such minutes! How grateful I am to providence for them! Finally we come back to our phrase. - Do you understand? - asks Bruno Maximovich. - Yes, I do, - I answer miserably. - Well, then, let's go on, - he says and beats the "drum" of impatience with the tip of his shoe. I know, I know - Bruno Maximovich hates empty time, and so I intuitively extract from my mind a group of separate words. He prounces upon this "flock" like a hawk, snatches up the one SINGLE word he needs, then adds all the other ones and shoots them all at me. Well, I do know how to write real fast! A second - and the phrase is on paper! - Bravo, - says Bruno Maximovich. - You are a remarkable physicist! And we pass over to the next phrase. In the last summer of his life, I asked Bruno Maximovich, how he explains that it was easy for us to write together from the very beginning. The first publication in Uspekhi Fizicheskikh Nauk in 1955, written with my help, appeared 4 months after I came to the Laboratory. And he said: "We think in the same way". Actually, Bruno Maximovich mastered the Russian language very rapidly and knew it perfectly. He unerringly felt the nuances influencing the meaning of Russian words and expressions, and he always chose the most exact and beautiful ones. But he would not trouble himself in colloquial language. (Naturally, I am not speaking of scientific discussions). He would not stick to correct cases. He could put prepositions in wrong places or drop them completely, pronounce the first part of a word correctly and the second in some other convenient way, he replaced words by other similar ones, but - it so happened - with words sounding more comical. 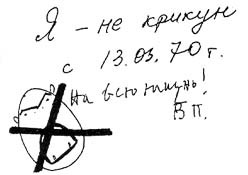 When we were working on the recollections of E.Fermi, Bruno Maximovich once dictated the phrase: "Thus, Fermi laboured all winter without a pechka ..."("stove" in Russian). I wrote it down, feeling puzzled, not understanding what a stove had to do in a strictly physical text, but then I decided Bruno Maximovich wanted to incidentally draw attention to the "heroism" of Fermi who had to work in hard conditions. When the notorious "pechka" finally conceded its place to the legitimate speshka ("rush" or "hurry" in Russian), we laughed merrily. His way of "playing with words" always gave the impression he was doing it on purpose. I remember how, instead of the word pah-ook ("spider" in Russian), he once invented the comic word oopook. We liked that word very much, and subsequently often used it in many various situations. Once we found the following note on the glass of our car parked on the edge of the road near Foros, in Crimea, where we liked to spend our vacation. on Monday, 29-th of September. We immediately understood that Bruno Maximovich was in Crimea and that he would soon visit us with great plans for underwater fishing. I was born and grew up at the Black sea. Since childhood I was a good long-distance and long-time underwater swimmer, but I really got to know the fabulous beauty of the underwater world only in the 60-ties, when Bruno Maximovich gave me a mask and fins, unique underwater equipment in our country at the time. Bruno Maximovich was called the father (and, friendly, when he became older, the grandfather) of underwater sport in the Soviet Union. He was keen on underwater fishing before the 80-ties, and not only at the Black sea. He took part in an expedition to the Pacific ocean, knew all the rivers with transparent water around Moscow. He had a special hydro-suit "Calypso", fins and masks of several types, and lots of underwater equipment: a special belt with weights that could be regulated, a knife for sharks, an underwater torch, a net for the fish, numerous colourful tightly packed packets fastened to his belt which were to be gently squeezed in the case of danger under the water and which were consequently supposed to be inflated into large balloons and to push the swimmer toward the surface (no attempts to verify this ever happened to be successful). And, naturally, a large amount of underwater guns and harpoons with a great variety of tips. The ritual of dressing in all these things proceeded slowing and ceremoniously. First, the entire outfit, colourful and shining in the Sun, was laid out in strict order on the bank. The actual site, where this took place, was immediately surrounded by a circle of curious people of all ages. The squatted down and started a discussion. Everyone was allowed to touch everything, to try it on ... Once, after such an "inspection", a miniature, working, underwater gun, ingeniously constructed in the workshop of our laboratory, with an inscription - a present for his 50-th birthday - disappeared. Bruno Maximovich was upset for a minute, then he cheerfully congratulated the local boys with a good acquisition. Each time, a serious discussion was under way on whether he was to put the whole "Calypso" on or only part of it, as to which tip was to be fastened on the arrow, on whether he should take or not take one or another thing with him ... And, at the end, "just in case", everything went with him, in particular his most liked two-meter-long three-pronged harpoon. The dressing finished, Bruno Maximovich sighed deeply and entered the water accompanied by the enthusiastic looks of admirers. The great game of underwater hunting started. The catch had no special importance, and its frequently being absent did not upset Bruno Maximovich. But there were also times of unheard-of success, for instance, those two famous white gorbyl-fish got by a single shot near the offshore rocks of Gurzouf, an event the local fishermen remembered for several years. In autumn, when the cold water in the natural reservoirs lost its appeal, Bruno Maximovich switched over with the same enthusiasm mushrooming. He especially liked to gather champignons, which was the least difficult: one just had to correctly calculate the field. We used to go in several cars. Bruno Maximovich put on his Svan cap (Svans are an ethnic minority in Georgia) and took 2 or 3 large-sized baskets and several somewhat smaller. And they actually did happen to be full to the brim sometimes. In the evening at the big oval table in the living-room of Bruno Maximovich's house a mushroom party took place. And the conversation was always sure to go back to recollections that in the old times nobody in Italy ate mushrooms, since they were all considered poisonous. "I pity those poor Italians", - Bruno Maximovich used to say, enjoying the delicious meal. If we didn't happen to be lucky with mushrooms, we made spaggetti under the supervision of our host strictly adhering to the rule that: "The sauce must not taste better, than the macaroni!" Bruno Maximovich himself shared out the spaggetti from the enormous pot; and no matter how we tried, he had no rivals in the graceful art of applying a fork when devouring them. Bruno Maximovich liked to be among people, he was a very benevolent and friendly person. He never admonished anyone or tried to impose his own opinion, although he did try to convince, but without insisting. However, most often he would listen patiently, look at one for some time and say: "Probably, you are right". He was never an eloquent speaker, who could freely lead his an audience through the maze of his recollections and reasoning, even in his later years. His speech was terse and clear, while his reasoning was so interesting and original and expressed so clearly, concretely, and in such a noble manner, that to converse with him was a real pleasure. He always answered questions. Bruno Maximovich was very modest, and the little in which he permitted himself to take pride (and even then silently!) included a muscule on his right arm - the result of his great love for tennis in his youth. That was something nobody had ever seen! It was enormous and so hard that it seemed to live its own majestic life on the arm. When Bruno Maximovich strained his arm, while we respectfully touched the muscule with our fingers, we had the impression that we were touching a big stone. And Bruno Maximovich's eyes shined cunningly. With the years the muscule became weaker and then disappeared completely. Soon after JINR was founded, Dubna became "open", and a great flow of individuals, crowds and groups of cinema-photography and radio professionals, journalists, writers, artists - prominent and not so prominent - starting arriving. They attended seminars, took part in runs at the accelerators, made drawings, photographed, interviewed and looked with extreme interest at these "mysterious" physicists. And, naturally, they all wanted to meet the famous Pontecorvo. I remember the great impression I got from the invariable categorical refusal of Bruno Maximovich: "I am sorry, but I stick to the principle: I give no interviews". Or: "A portrait during my life?! Never!". Being under the magic charm of his personality, I once used the same words in answering an artist who proposed to paint my portrait. Now it seems funny and a pity. About at the same time, disputes on poetry were raging in Moscow. And in Dubna, also, encounters with well-known poets gathered enormous audiences. Physicists and admirers of lyrics competed in wittiness, "contending for excellence". The general love for poetry fascinated Bruno Maximovich. He used to say he never saw such a strong liking for poetry, as in Russia. He lamented that he didn't always understand poetry, and rejoiced at the ability of many people to compose verses and poetic addresses on appropriate occasions. that fifty is a lot! Probably, this was the only work in verse written by Bruno Maximovich himself. And he was openly proud of it. The beginning of this verse became standard for us. We applied it in appropriate cases, altering, when necessary, the actual age. The further content of the verse was always strictly individual. Many years later, when Bruno Maximovich started to be ill, his Moscow friends convinced him to go to the well-known healer Juna. He visited Juna several to undergo treatment, and then returned to Dubna. "Signora Juna is curing Bruno? Will he meet with luck?" His was not good luck. In ordinary life Bruno Maximovich was very fond of mischief. No day passed without soome trick. There exist many recollections of his jokes and tricks which he was always successful at. I remember the first trick he played with me. At the very beginning of my work in Dubna, Bruno Maximovich once proposed to take me home for lunch on his bicycle. I sat down on the rack and off we went. Everything proceeded normally until we saw a familiar face. Here Bruno Maximovich bent over the handlebar and started groaning and pushing the pedals with difficulty, tilting the bicycle to one side and to another, wiping his forehead with his handkerchief, thus clearly showing that his "luggage" was too heavy. As soon as Bruno Maximovich saw from the expression on the face of the passer-by that the desired effect was achieved, we continued our journey normally. At each new encounter everthing was repeated. I was very shy at the time, and blushing with embarassment I bumped along on the rack through the whole town. Already of respectable age, in the 80-ties, upon learning that my five-year-old daughter had gone to two lessons of English, Bruno Maximovich immediately rang her up by telephone "directly from America" and presented himself as an American boy; then he started asking the poor little girl lively questions in English. It seems to me that of all the sad people in the World Bruno Maximovich was the most cheerful. In the summer of 1978, for the first time after a gap 28 years long, Bruno Maximovich returned to Italy. Only for several days. Subsequently, he went to his native country often, and during the last years spent long periods of time there. He was full of impressions of Italy that was new to him, of Italy which was poor when he left it and had become a flourishing country. He was especially enthusiastic when he spoke of the numerous small old towns, which had retained their medieval appearance, which he adored and which he hadn't known at all before. Bruno Maximovich was always met with true respect. He gave lectures to students, took part in the work of conferences and workshops. My God, how I don't want to approach the inevitably sad end of short story! Well, some words. The first signs of the Parkinson disease became seen after Bruno Maximovich returned from Italy the first time, in 1978. And since then his illness progressed steadily. Only owing to the courage of Bruno Maximovich, who fought against it practically alone till the very end, not giving in to despair (at least never in company), in spite of his being in great torment and his sometimes helpless state, only owing to his great will-power and strong spirit did he live among us for 15 more years. The last time Bruno Maximovich came back from Italy at the end of May of 1993. We were waiting and preparing for his 80-th birthday, which we celebrated the 22-nd of August, in the Laboratory, with many people participating, with much ceremony, with sincere love and respect. And already in the first days of Septmeber, on one of the days, an irreversible shadow showed up in the look of Bruno Maximovich. He himself was the first person to see the change. He came to the Laboratory several times more. He was silent, calm and very sad. He said he didn't want to disturb anybody. Anyhow, he always repeated that all his life. Two days before his death, Bruno Maximovich came to the Laboratory in the evening. For a farewell. He looked at the yellow birch-trees through the window. "How beautiful", - he said sadly. Then I escorted him to the gate of the Laboratory, where his son Tito was waiting, and we joked on the way. Two days later he passed away. - Farewell, dear Bruno Maximovich, - a whole era in science, in the lives of many people and in my destiny!